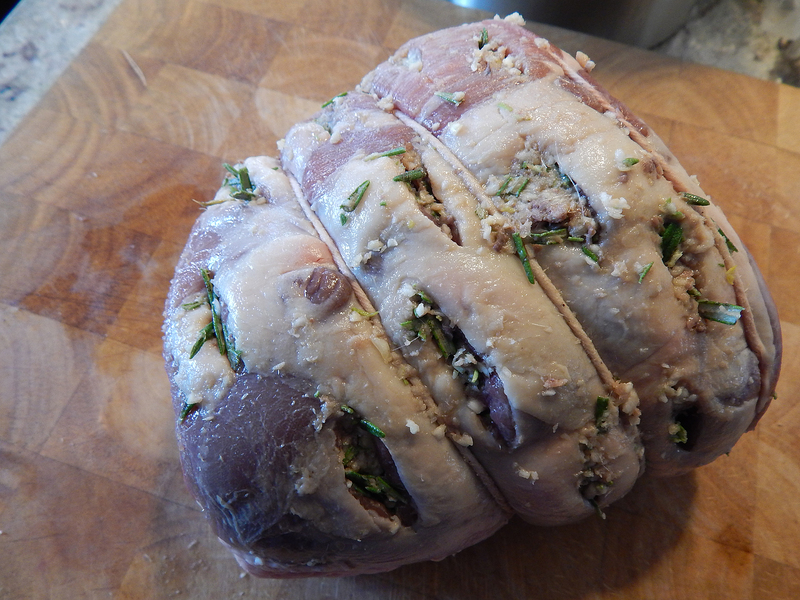 If you haven’t cooked a whole leg of lamb before, here is the place to start. This is not a revolutionary recipe, but slathering on butter and (take their word—and ours—for it) anchovies makes this version truly essential. Most American lambs are fed both grass and grain, yielding meat that is fine-grained, earthy and mild. 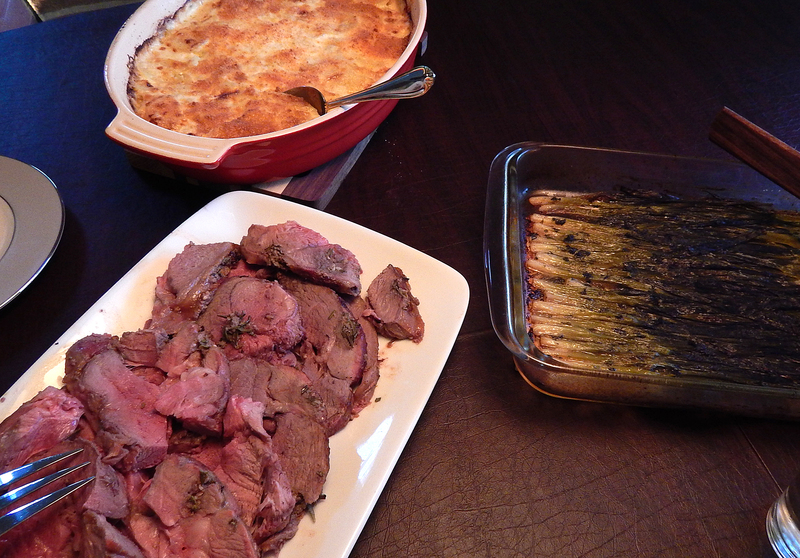 Pretty much every Easter we celebrate with a lamb dinner, and not to deviate from our norm, we tried this delicious Roast Lamb recipe found on the New York Times cooking site, pairing it with a Potato Leek Gratin and Braised Scallions, both from cookbook author Molly Stevens. If some of your guests claim not to like anchovies, don’t even tell them, because in the end, you’d never be able to guess that was an ingredient, but it makes all of the difference in depth of flavor. 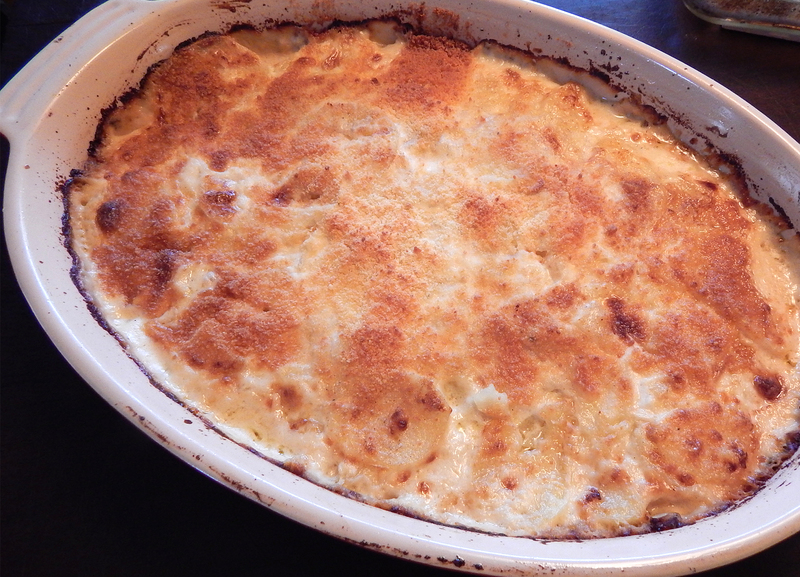 A while back when we made this potato gratin, we froze the leftovers and had them several weeks later with no visible or edible degradation. So we knowingly made the entire recipe, content that we would be able to successfully freeze a few portions for sometime in the future. 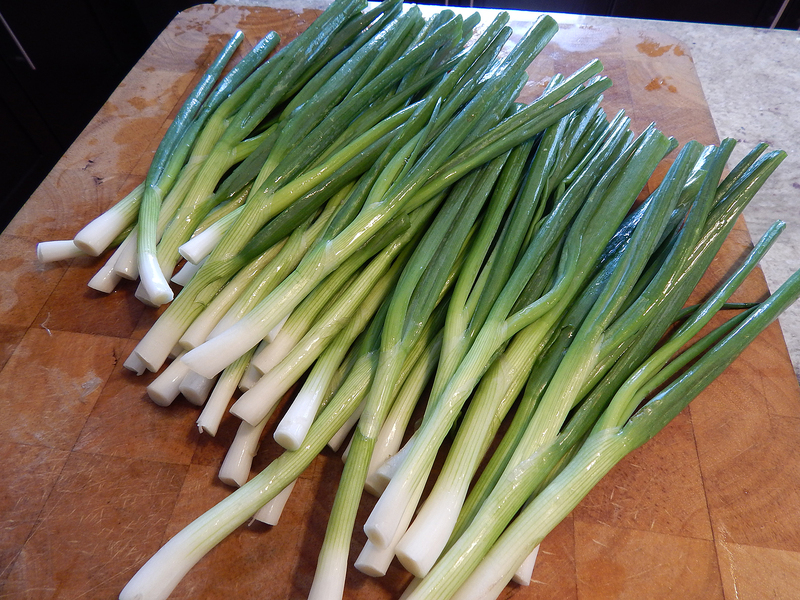 The scallion instructions call for 5 bunches, and believe it or not, Russ and I ate the entire dish of them between the two of us in one sitting! It’s similar to cooking spinach, you start out with what seems like an overload, but end up with a much reduced mass. Heat oven to 425 degrees. Use a small sharp knife to make about a dozen incisions, each about 2 inches deep, through the fat that covers the top of the meat. Using a mortar and pestle or a blender, blend 2/3 of the anchovies (or 2/3 of the mustard if using), the rosemary leaves and the garlic cloves into a chunky paste. Using your fingers, press paste deeply into incisions. 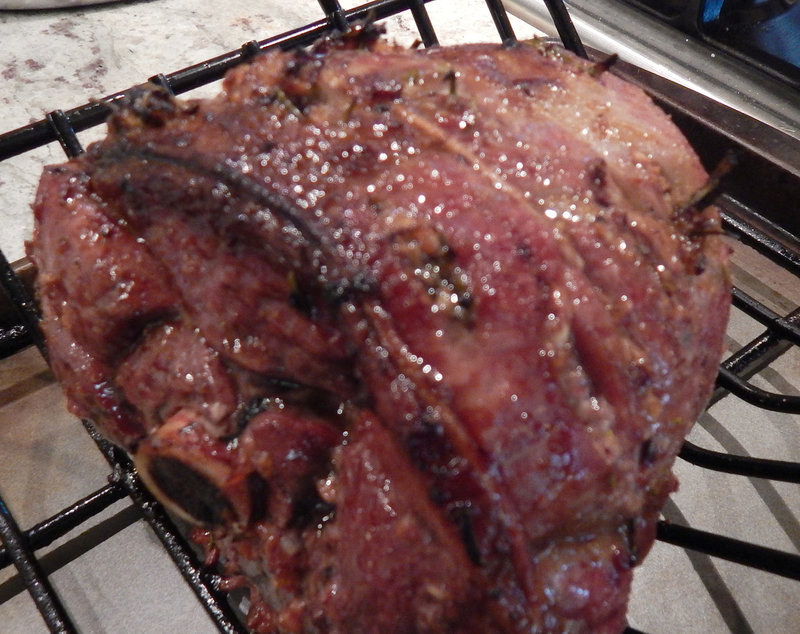 Place the lamb on a rack in a roasting pan, fat side up, and squeeze the lemon halves over. Pour the wine around the roast into the pan. Roast 15 minutes, then reduce heat to 350 degrees and roast until internal temperature reaches 130 to 135 degrees (for medium-rare or medium meat), about another 60 to 90 minutes. Baste every 20 minutes or so with the wine and drippings in the pan, adding more wine as needed to keep the liquid from scorching. 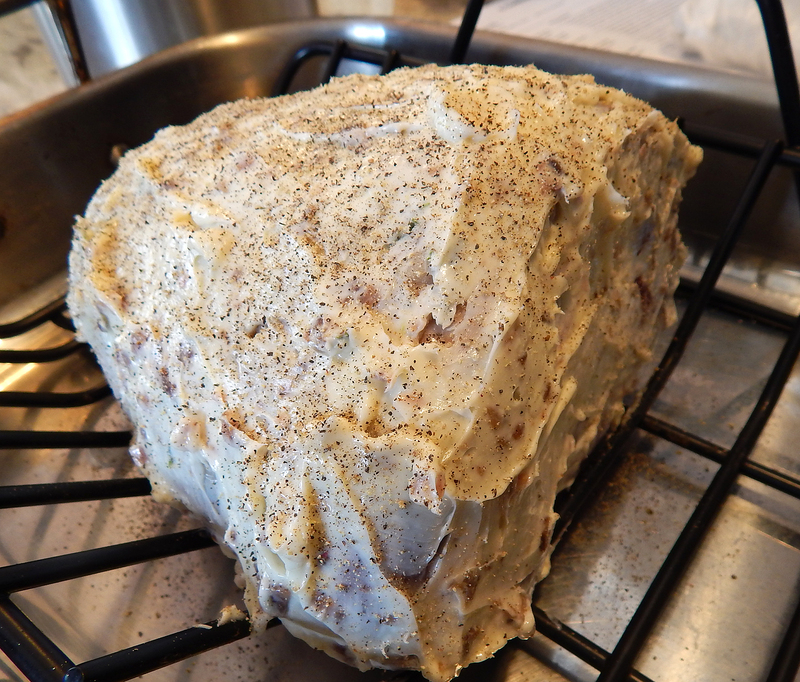 If possible, for the last 15 minutes of cooking, use convection or a broiler to crisp the fat on the roast. Remove pan from the oven, remove rack from the pan, and let the roast rest on the rack for at least 15 to 20 minutes in a warm place, tented with foil. The internal temperature will rise to about 140 to 145 degrees. To make sauce from the pan drippings, remove a few tablespoons of fat by tipping the pan and spooning off the top layer. Put the pan over medium heat until the liquid simmers. Taste the simmering liquid and whisk in more wine, 1/4 cup at a time, until the consistency and flavor are right. Do not let the mixture become syrupy; it should be a sharp jus, not a thick gravy. 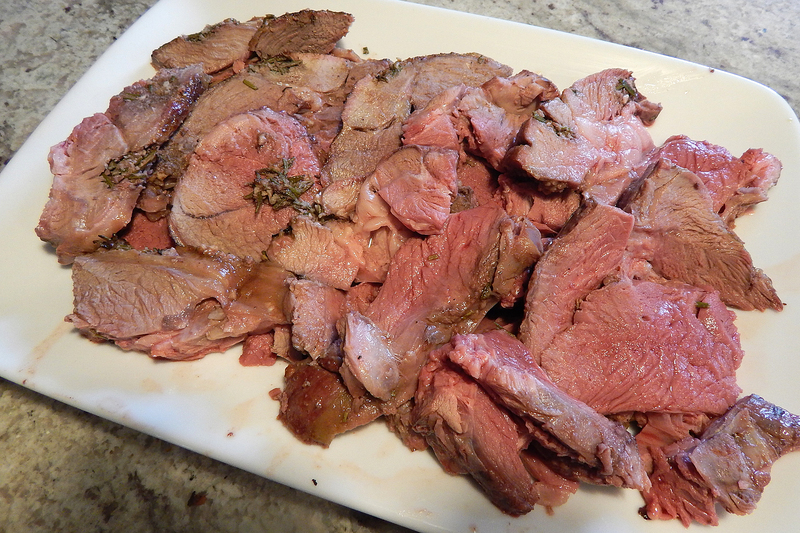 Carve lamb into 1/2-inch-thick slices and arrange on a heated platter, decorated with rosemary sprigs. Serve with piping hot gravy. Position a rack in the center of the oven and heat the oven to 400°F. Butter or oil a 3-quart gratin dish; set aside. 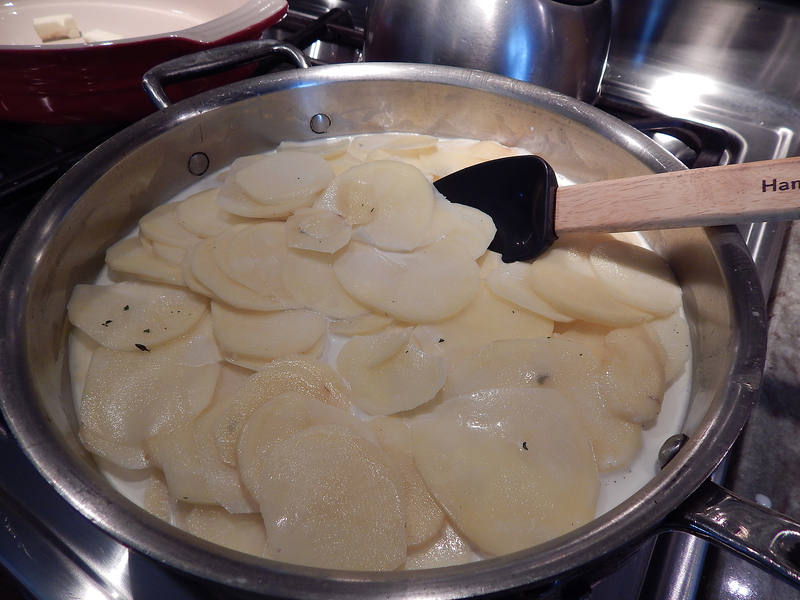 Put potatoes, half-and-half and cream, 1/2 tsp. salt, and a few grinds of pepper in a 12-inch skillet. Simmer, partially covered, over medium to medium-low heat, stirring occasionally and gently with a rubber spatula until the potatoes are barely tender when pierced with a fork or skewer, 8 to 12 minutes. 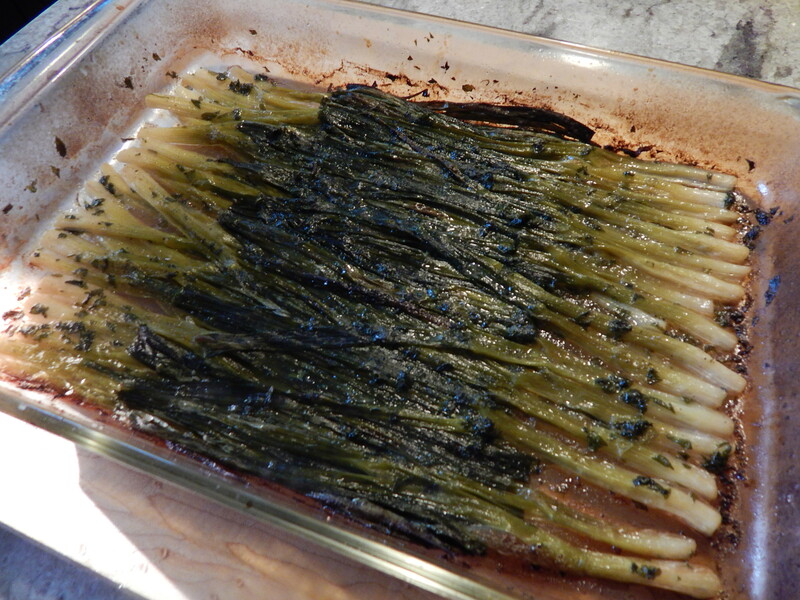 In a medium skillet, heat butter or oil over medium-high heat and sauté leeks until tender, fragrant, and lightly browned. Season to taste with salt and pepper. 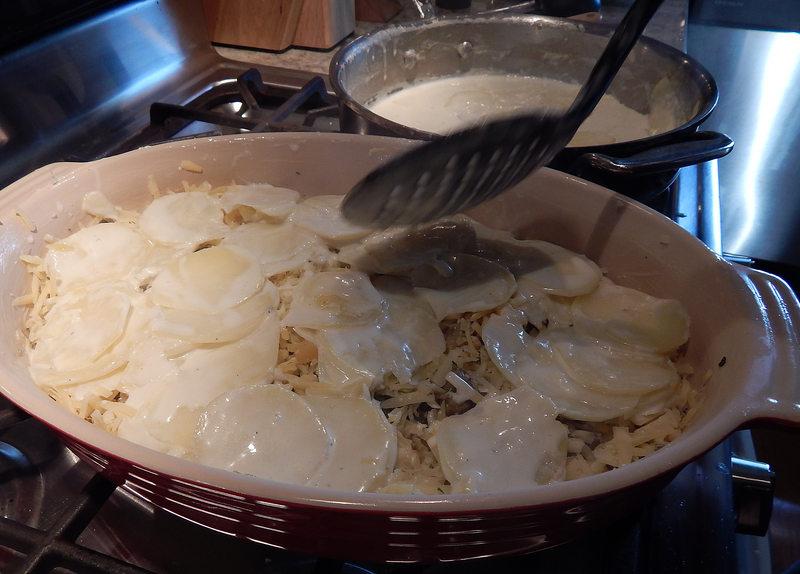 Using a slotted spoon, transfer half the potatoes to the prepared gratin dish, spreading them evenly. 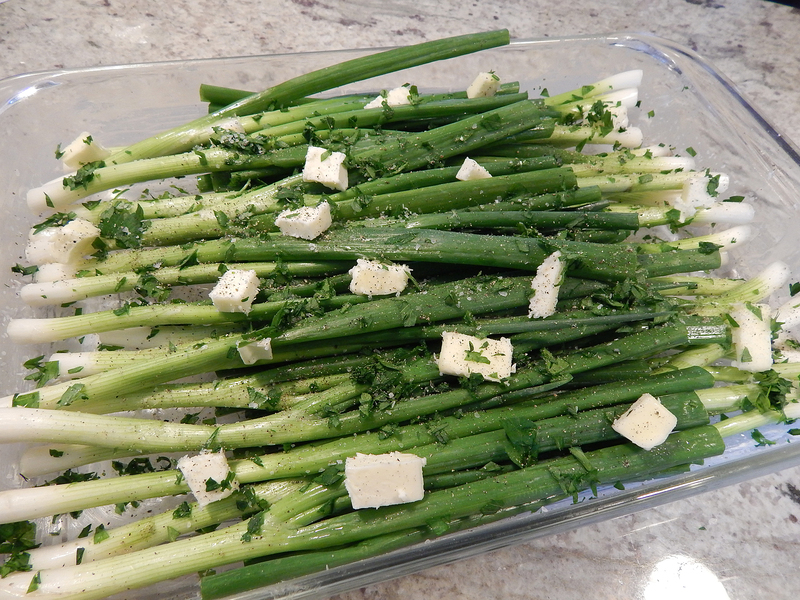 Layer on the leeks, Gruyère , and thyme. Top with the remaining potatoes, spreading them evenly, and pour over any liquid remaining in the pan.